Fifteen-year-old Ilya arrives in Louisiana from his native Russia for what should be the adventure of his life: a year in America as an exchange student. But all is not right in Ilya’s world: he’s consumed by the fate of his older brother, Vladimir, the magnetic rebel to Ilya’s dutiful wunderkind, back in their tiny Russian hometown. The two have always been close, spending their days dreaming of escaping to America. But when Ilya was tapped for the exchange, Vladimir disappeared into their town’s seedy, drug-plagued underworld. Just before Ilya left, the murders of three young women rocked the town’s usual calm, and Vladimir found himself in prison. With the help of Sadie, the beautiful and enigmatic daughter of Ilya’s host parents, Ilya embarks on a mission to prove Vladimir’s innocence. Piecing together the timeline of the murders and Vladimir’s descent into addiction, Ilya discovers the radical lengths to which Vladimir has gone to protect him—a truth he could only have learned by leaving him behind. Erica Jong is a celebrated poet, novelist and essayist with over 25 published books that have been influential all over the world. Her most popular novel, Fear of Flying, celebrated its 40th anniversary in 2013. Never out of print, it has sold over 35 million copies translated into over 45 languages including Chinese and Arabic. Her new collection of poetry is, as its title suggests, both affirmative and exhilarating. Whether she is writing about her grandchildren, the loss of her mother or an Alice Munro stamp, Jong’s images are always vividly evocative. Her poems are filled with an equal awareness of the sensuous nature of life and its inevitable decline. This is the work of a poet in her prime, filled with candor and wisdom. Late one spring night, Driss Guerraoui, a Moroccan immigrant living in California, is walking across a darkened intersection when he is killed by a speeding car. The repercussions of his death bring together a diverse cast of characters: Driss’s daughter, Nora, a jazz composer who returns to the small town in the Mojave she thought she’d left for good; his widow, Maryam, who still pines after her life in the old country; Efraín, an undocumented witness whose fear of deportation prevents him from coming forward; Jeremy, an old friend of Nora’s and an Iraq War veteran; Coleman, a detective who is slowly discovering her son’s secrets; Anderson, a neighbor trying to reconnect with his family; and the murdered man himself. As the characters—deeply divided by race, religion and class—tell their stories, connections among them emerge, even as Driss’s family confronts its secrets, a town faces its hypocrisies and love—messy and unpredictable—is born. the biggest rock bands in history. 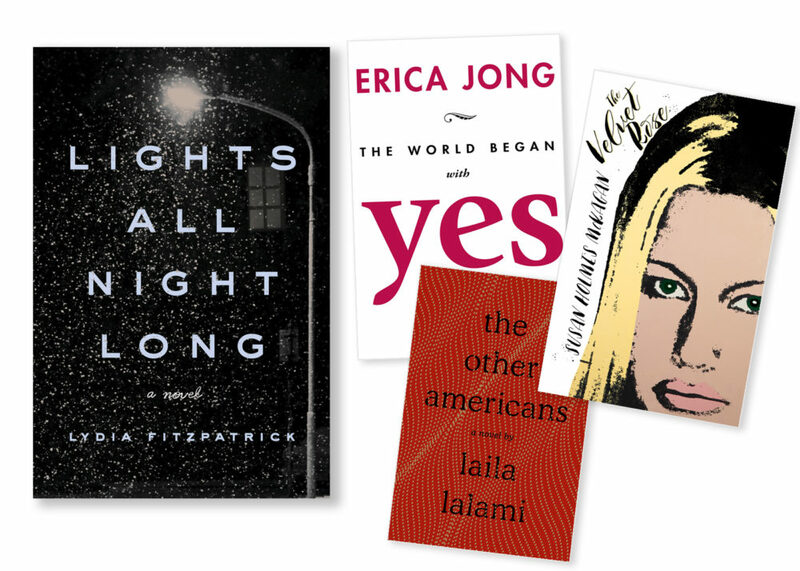 Lydia Fitzpatrick – Lights All Night Long Event, April 15, 7:30 p.m.
Erica Jong – The World Began with Yes Event, April 18, 7:30 p.m.
Laila Lalami – The Other Americans Event, May 1, 7:30 p.m.
Susan Holmes McKagan – The Velvet Rose Event, May 2, 7:30 p.m.